Allows you to make the most of your garden. Adds security to dark areas of your home. 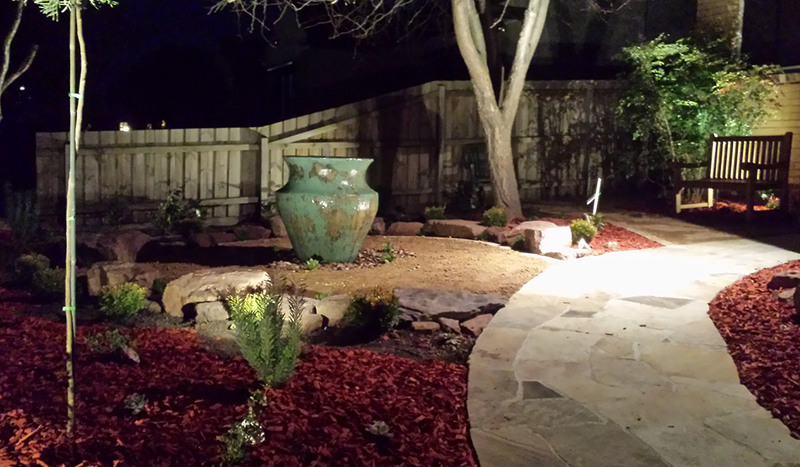 When designing your garden lighting ensure the lighting suit your lifestyle. Compliments your home and provides you with a refuge that is visually stimulating. We have an expert innovative garden lighting design team and professional installer. We work within your budget and provide you a design that transforms your garden. Our Lighting system is flexible and can be easily expanded as your budget grows. Our lighting system is not permanently fixed, can be easily removed if you move, change your mind or the size of the lights can be changed as your garden or families needs change. We supply only quality products designed and made in Australia. All our LED outdoor garden lights do not emit UV and Infrared so do not attract insects like normal lights; allowing you to enjoy the great outdoors without pests bothering you. Unlike incandescent, fluorescent and halogen lights LED lights do not have filaments to burn out LED’s generally have a lifespan of up to up to 100,000 hours. So 6 hours a day/ 7 days a week is 21 years or 50,000 hours; that’s a long long time! Each 0.5 watt LED emits as much light as a regular 8 watt globe, the advantage LED globes have is that they will last up to 70 times longer than a regular globe and use a fraction of the power so it’s not only great for you but for the environment also.